Luigi Persico, “Discovery of America,” Histories of the National Mall, accessed April 22, 2019, http://mallhistory.org/items/show/479. 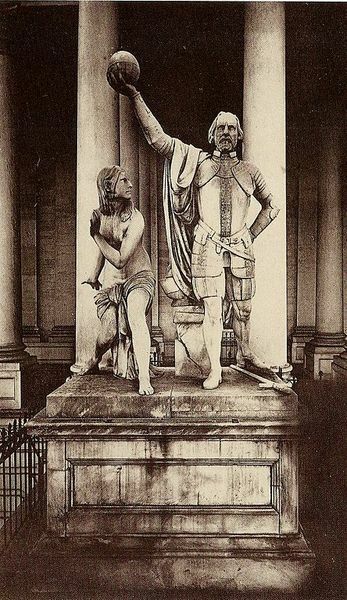 In 1837, the President and Congress commissioned Italian-born artist Luigi Persico to create a sculpture depicting Christopher Columbus to be one of a pair of artworks flanking the staircase on the eastern entrance to the Capitol. When it was installed in 1844, some politicians and art critics applauded it as a representation of Manifest Destiny. In 1958, Discovery of America and its companion piece The Rescue were removed in preparation for renovations to the east facade of the Capitol. By that point, both American Indian advocacy groups and members of Congress were highly critical of the sculpture. It was not reinstalled when the renovation was completed. The statue shows Columbus with a globe in his raised right hand. Just to his right is a cowering American Indian woman. The statue stood to one side of the staircase to the eastern entrance to the Capitol, on the left side as one faced the building.